Let's get this organizing fun going! Who has a goal this year of being more organized? Who has that same goal every year? Yep, that's what I thought. I don't make a yearly organizing a goal, I just like to find new ways to organize, and update past organizing strategies every year. And honestly, you should really re-evaluate your organizing every year; your family, and their needs, change every year. There is not some magic one size fits all organizing system or tip that is going to work forever, that's just how it is. I organized our boys' closets not that long ago, but now they are sharing a bedroom (their choice), so we needed to update the closet situation. They each have a captain's bed, which I have a serious love/hate relationship with by the way, so about half of their clothing is stored in their beds, and the other half goes into the closet. Use hanging sweater organizers for t-shirts, play clothes, sports uniforms, hats, etc. 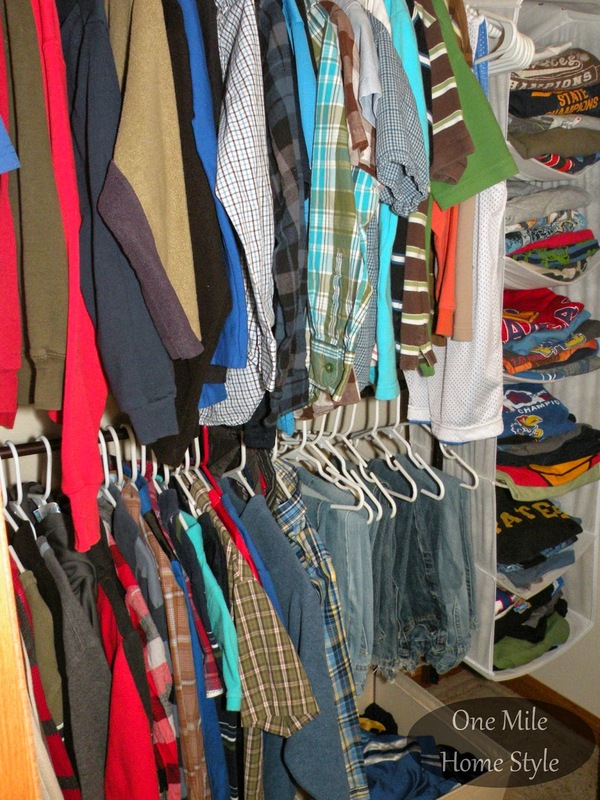 Using a lower hanging rod not only makes it easier for the kids to reach clothes on their own, they are a perfect way to divide a shared closet. The oldest kid's clothes are on the top and the younger kid's clothes on the lower one. These hanging sweater organizers can be used for so much more than sweaters. 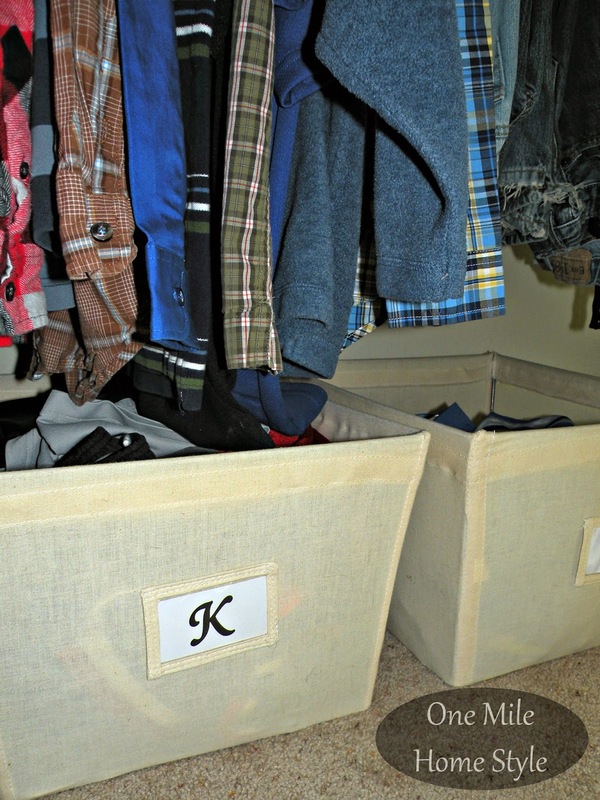 (Think outside the box when you are organizing, many organizational items can be used in multiple ways.) 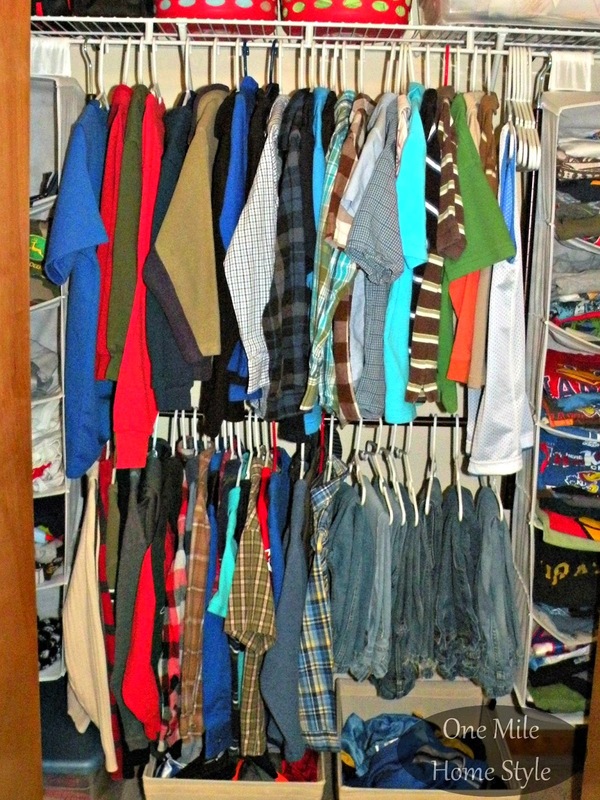 For one son, all his t-shirts go into one organizer on one side. For the other son, ties, hats, play clothes and sports uniforms go into his organizer, his t-shirts still fit nicely in the drawers in his bed. Hanging up jeans freed up much needed space in one over-crowded drawer. The other son is able to keep his jeans in a drawer still. Since the athletic pants and shorts don't wrinkle, and they always seem to be in a wadded up mess the the drawers, each kid has a bin at the bottom of the closet for these items. It makes putting them away easy and finding them is easier too. 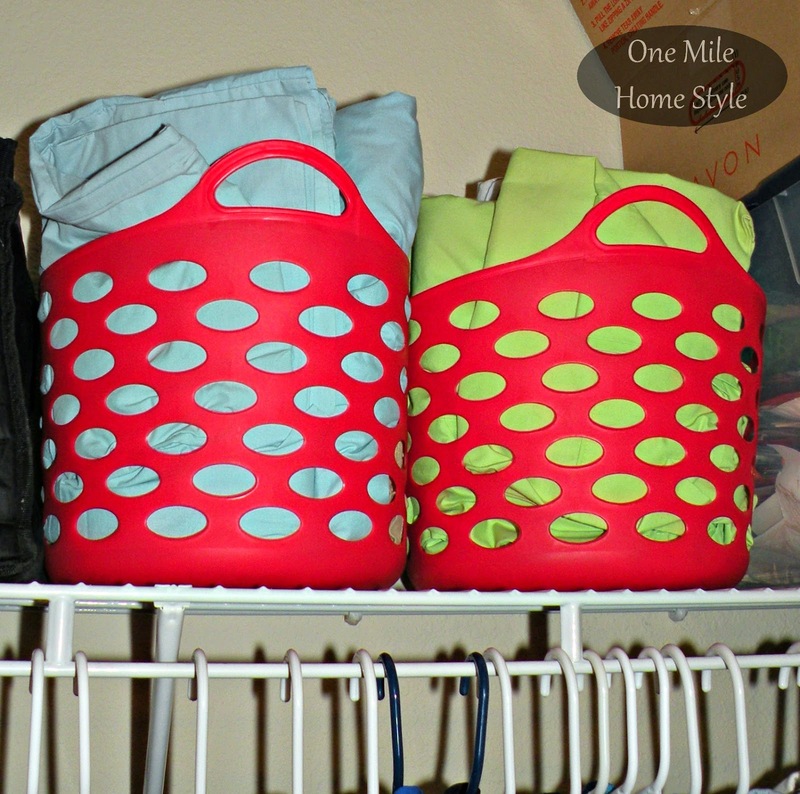 This last one is so easy and frees up space in your linen closet too. Keeping the sheets for each bed in the top of the closet makes changing the sheets so much easier. No need to search for the correct sized bedding or that missing pillowcase, it's all there in one basket. I encourage you to take these tips and use them to get more organized. But, make them fit your needs and your family. As you can see, even within one closet, what works for one kid in the room, does not work for the other. These are the tips that we use, but we also bend them to meet our individual needs, and you should too! 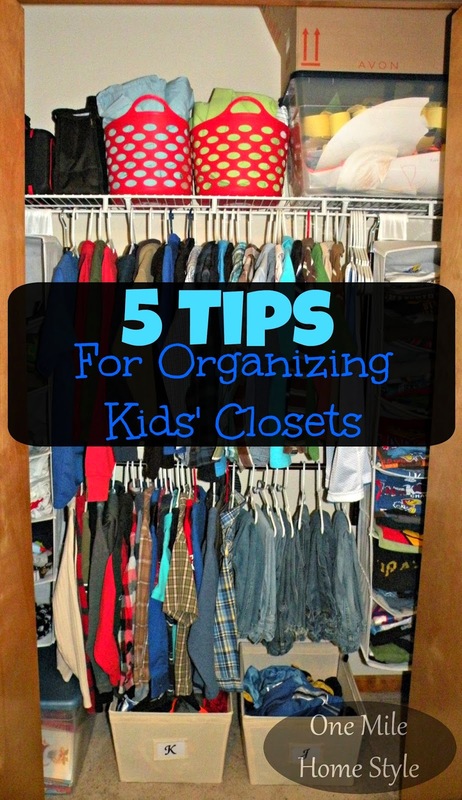 What are your rockstar tips for organizing your kid's closet? 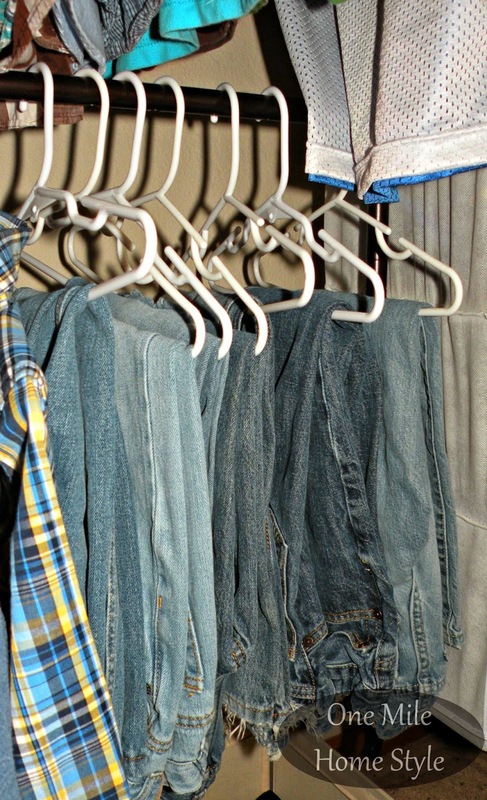 *This post contains affiliate links to items similar to those I used in our closet organizing. If you click on the link and choose to purchase any of these items, I may earn a small commission. You are not charged extra, and you are helping to support the One Mile Home Style blog. You can trust that I will only link to items I own, or that I would purchase myself.